I’ve never done this, but it looked kinda fun, so here goes! If you’ve taken part in FMM then you know the rules. 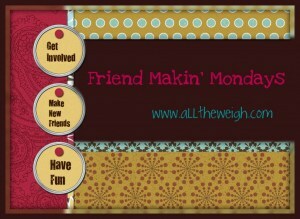 If you’re new, please take a moment to answer this week’s question on your own blog then add your link in the comments section here at alltheweigh.com so we can all see your FMM questions and answers. Please invite your blog readers to add their links here too so everyone has to opportunity to be seen. The idea is to connect with other awesome bloggers so take a moment to post your own FMM post and comment on a couple of other posts. Now it’s time for this week’s topic! Food – Robin Eggs! Yay for Easter candy! Now it’s your turn to answer the questions! Don’t forget to come back and link up in the comments. Happy Monday Friends! Day 22 – What is your most beloved childhood memory? What memories are you trying to create (or will you try to create) for your child(ren)? It’s hard for me to zero in on a single one. I had a pretty happy fun childhood. Some standouts include Christmas (of course! ), camping trips in the North Carolina mountains with extended family and friends, getting together with my cousins for some mayhem (Thanksgiving comes to mind), Disneyworld trips. That’s a lot, huh? We didn’t have very many family traditions (at least not compared to DW’s family), but we did have a lot of fun! I want holidays to be super special for him, with lots of traditions (mostly from DW). I can’t wait for trips to Disneyland, Hearst Castle, Europe, etc., etc. I want him to have a taste for travel and adventure. Day 23 – What are your favorite activities to do with your kid(s)? Gymboree free play (the classes, not so much), swimming, and reading. We are going to Legoland with friends in a few weeks! Can’t wait! Day 17 – (for parents) What is your favorite thing about parenthood? Your least favorite? My least favorite is dealing with the sleep stuff. Not sleeping through the night, nap transitions, not wanting to go to bed at night…ugh! I'm not really big on it. That said, I am a Taurus and must say that it does match my personality. Stubborn!